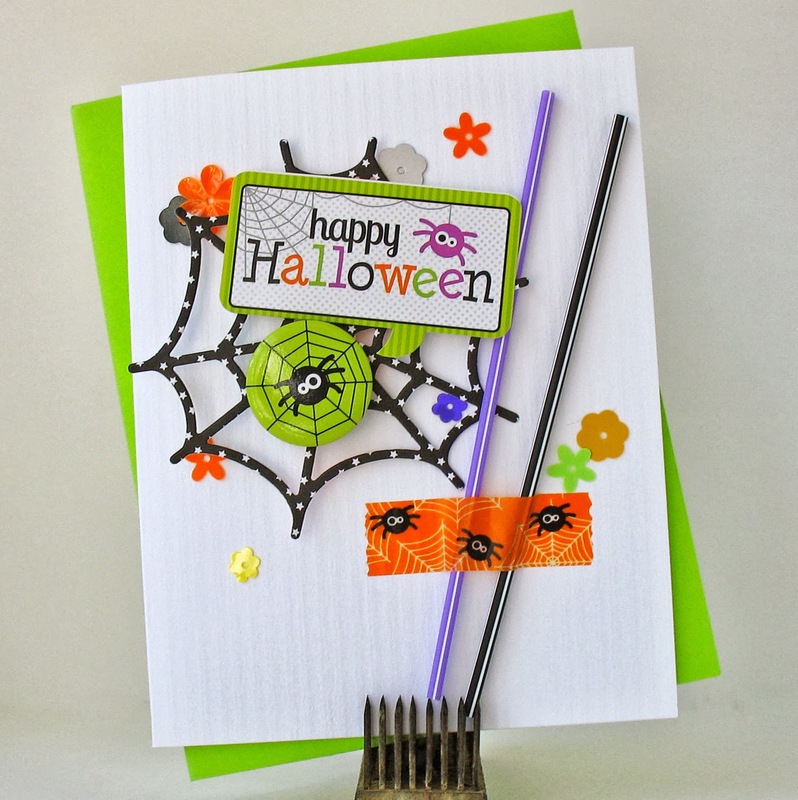 Please email us your shipping information at doodlebugdesign.blog@gmail.com and put "Happy Harvest Pixies Winner." Now let's go Trick or Treating for some yummy ideas today on the blog. 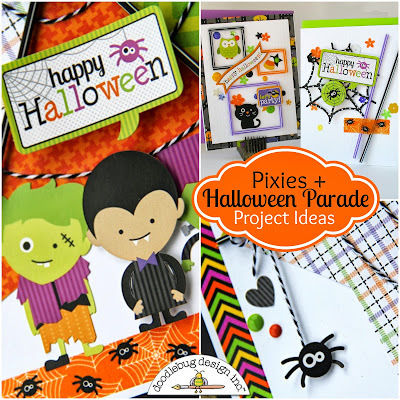 We're still sharing some amazing Halloween Parade Collection ideas on how to incorporate Pixies into your Layouts and Cards. Combine them with adhesives from Xyron and you are only limited by your imagination. Here's some too cute to SPOOK project ideas from Jodi and Kathy. Be sure to look close at how they used the PIXIES. Then be sure to scroll down and find out what you can do to win! Hey Doodlebugs! 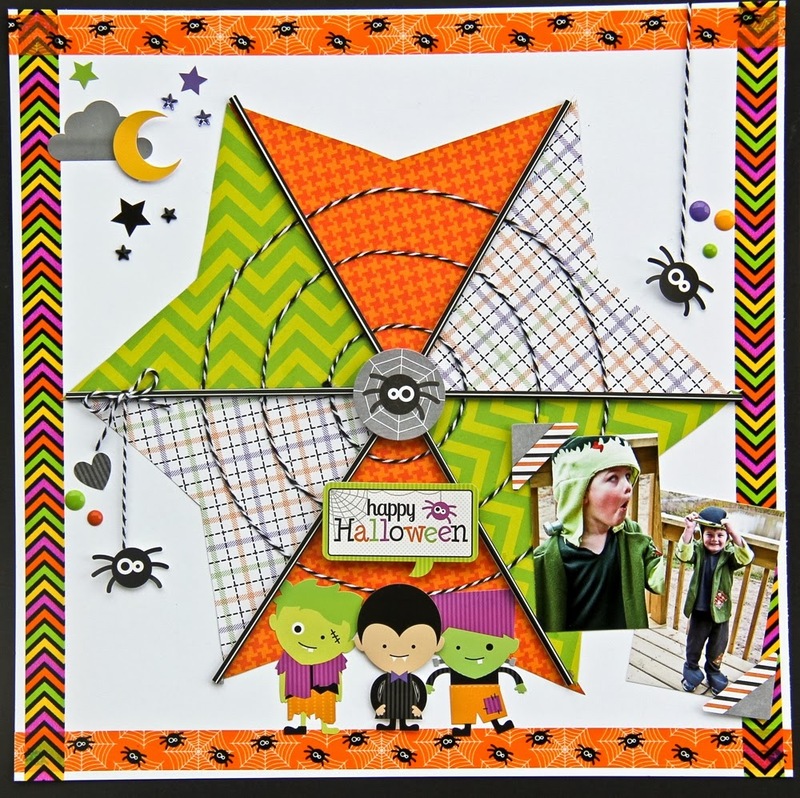 Kathy Martin here with a project share using the fabulous new Pixies and Halloween Parade line! 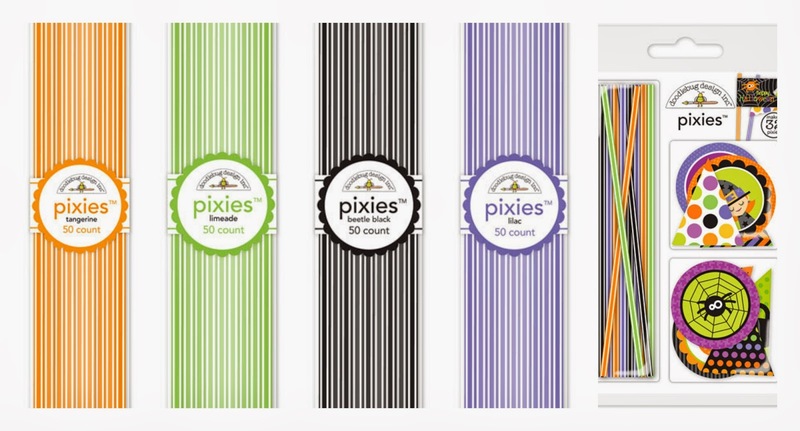 Pixies have become a new favorite accent of mine! They're colorful and fun and I can't wait to decorate my next batch of home-baked cupcakes with them! I've already used them on a number of projects and today's goal was to step outside the box a little and find a couple unique ways to use them. For the spider web card I thought they looked fun as part of a cluster of elements accented with the Doodlebug Washi and for the second card I made little squares to frame my embellishments. 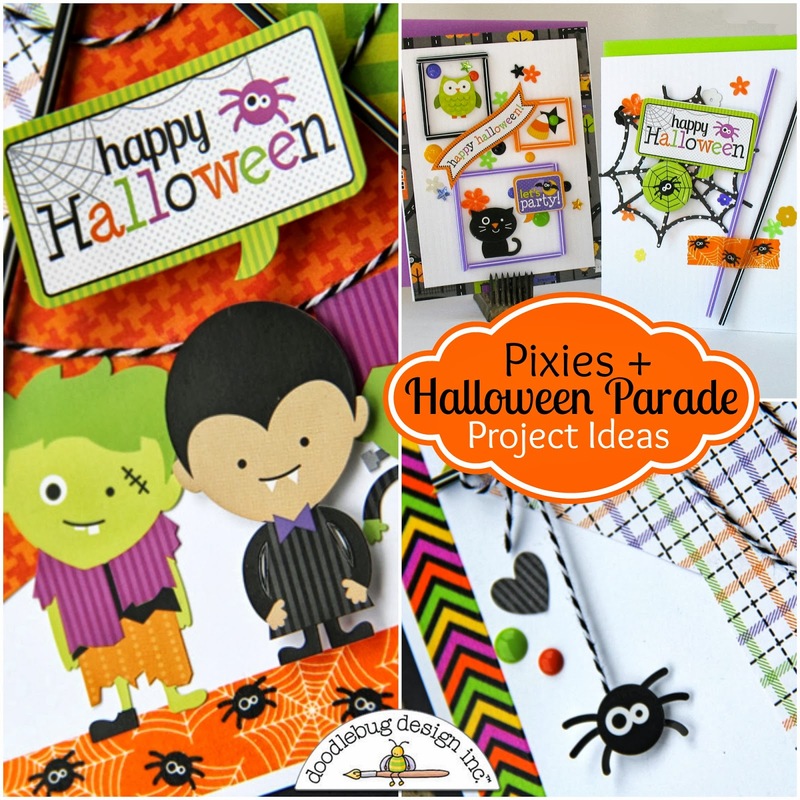 We'll be giving away a set of the new Halloween Parade Pixies and Toppers (shown above). Go check out the projects on Xyron's blog for the past two days and let me know which project you like the best...leave a comment. We'll announce the Doodlebug winner tomorrow on the blog and offer a new giveaway. And don't forget to stop by the Xyron blog to enter to win some fun adhesive products. I really like the cards by Stacy Rodriguez and the layout by Jennifer Priest. Your cards above are really awesome! I love the web and frames you made with the pixies. 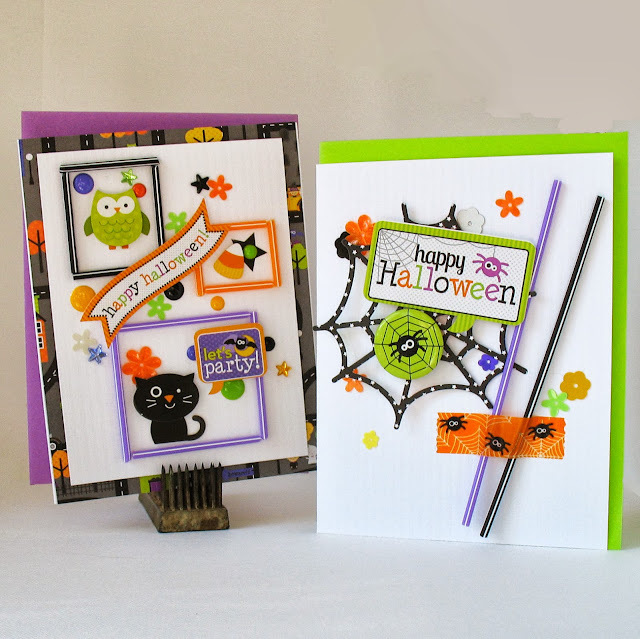 I loved Stacy Rodriguez's cards, so bright and colorful!! This is such a fun line! I love it!! Right now my fav project is the Fall lo by Shannon Morgan. 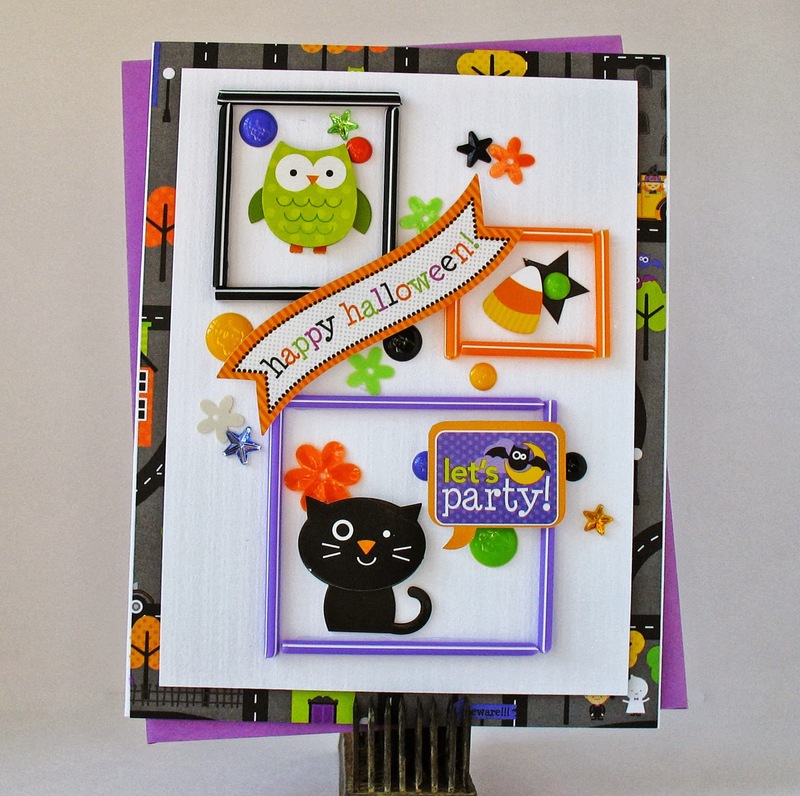 I like the Halloween layout by Jennifer Priest. Good use of all the new Halloween collection. My favorite project on Xyron's blog is Jennifer's layout, but I am partial to layouts and Halloween. The use of pixie's is a wonderful added dimension to cards and layouts that I am going to have to do. Just love Jodie's project above!!! Great ideas today ladies. I love the layout and frames on the card. My favorite project on the Cyron blog is Shannon Morgan's layout. Ok, ok these are so awesomely cute!! Love the web effect on Jodi's layout!! And Kathy simply knocked it right out of the park with these super adorable cards!! Love the pixie squares!! And from Xyron's day 1 post I loved the cards by Stacy Rodriguez!!! I love the witch boots from the Xyron blog. What fun and wonderful LO and cards on this blog! On the Xyron blog, my favorite is the witches' boots! Thanks for the chance to win! Jodi and Kathy, you are both so talented. I come each day to see what new wonderful projects Doodlebug will share. I love all the crafts you have done with these 2 collections. I am crazy about the pixies and I love the witches shoes. But the card with the little fox (who I adore) is so cute. You're the best Doodlebug. I love the "Hey Foxy" card! I love the witches shoes. then she used the scraps to make some great cards. Totally awesome projects you have featured today....LOVE, LOVE, LOVE the boots over at the Xryon blog!!! Thank you for the chance to win! Very nice projects today and also on the Xyron blog...loved the boots and the envelope with insert. They were all amazing but it really loved the witches shoes! Spooktacular witch's shoes!!!! Gotta make me some of those!!!!!!!! Thanks for sharing and for the chance to win!!!! I love the Halloween embellishments! I never would have thought of using pixie straws. You guys found a cool way of using them! Love the spider web on the layout and love those witch boots on the Xyron post. I love Stacy's fun cards! Great colors! 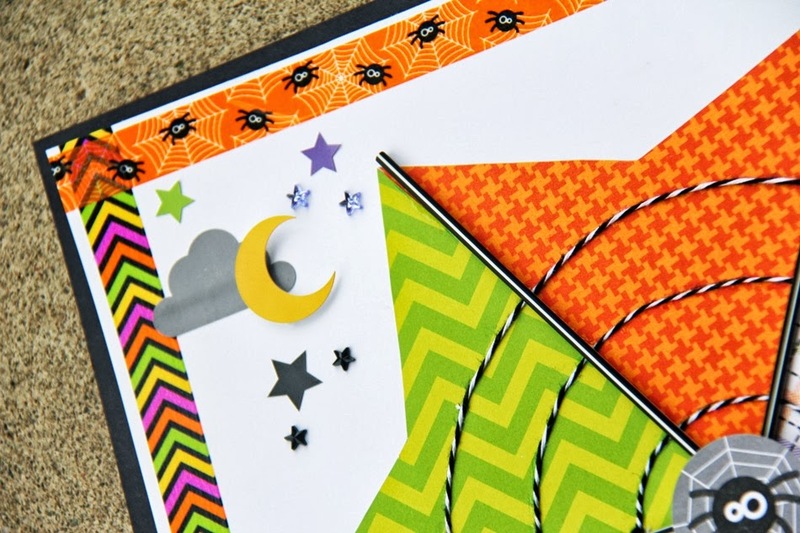 I am a Halloween fanatic and these projects are awesome! I can't pick just one I like them all. Wow that LO is just so fab! So many fun details. Love the use of the pixies as a frame...great ideas! Love the witches' shoes from Cari Locken the best - what a cute project! I love the dry erase board. 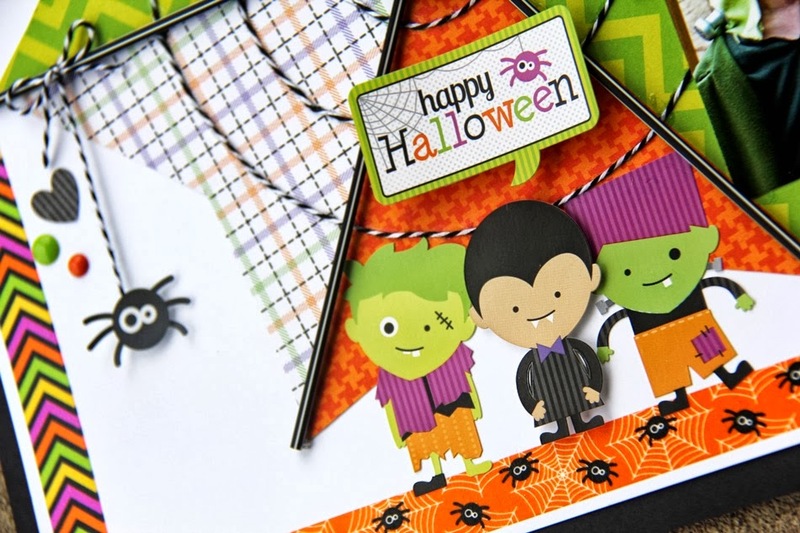 I think my favorite is today's Happy Halloween Layout!! It is really cute!!! I love the witches shoes from Cari! They are awesome and I love the way the pixies were used above!! I like Gean Cagles card-the paper bow is such a delight! I love ht epixies-I need some to make little easels for Halloween cards to sit on!